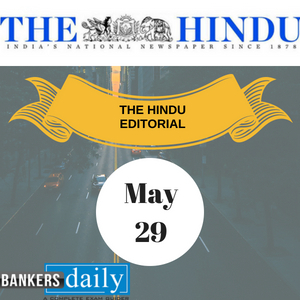 THE HINDU EDITORIAL – July 2, 2018 is one of the must read for the competitive exams like SBI PO Prelims , SBI CLERK Prelims Exam, BOB PO Manipal Online Exam and South Indian Bank PO Manipal Exam. These topics are widely expected to be asked in the reading comprehension , Cloze Test or in Error Detection topics in the forthcoming exams. So gear up for your Exam preparation and learn new words daily. New Delhi has clearly opted for a charm offensive in the Indian Ocean Region (IOR). The red carpet laid out for the visiting Seychelles President Danny Faure last week came against the backdrop of setbacks in the bilateral relationship owing to the Assumption Island agreement being put on hold. The pact, to build a naval base on the island, was seen as a major strategic enhancement of India’s IOR naval capacities and had been under discussion since 2003. It was finally signed during Prime Minister Narendra Modi’s visit to the Seychelles in 2015. The deal was to include 30-year access to the base as well as permission to station Indian military personnel on the ground, with facilities on the island funded by India, owned by Seychelles and jointly managed. After Opposition protests about loss of sovereignty, however, it had to be renegotiated and an amended version was signed in January 2018. Even that proved insufficient. Mr. Faure lacks the numbers in the legislature to ratify it, and with the Opposition sticking to its stand he announced in early June he would not be taking the agreement with India forward. Instead, Seychelles would build the naval facility “on its own”. Given the blow to India’s plans, Mr. Faure may well have expected a cold reception in India. However, both sides decided to walk around the minefields relating to Assumption Island, with Mr. Modi saying they would work on the project “keeping in mind each other’s interests”. India also announced a credit line of $100 million for Seychelles to purchase defence equipment from India to build its maritime capacity, offered to finance civilian infrastructure including the official buildings, and handed over a Dornier aircraft for maritime surveillance purposes. This is good strategy. It would have been pointless to push the Seychelles President for a more concrete assurance on the Assumption Island project, as he has little room for manoeuvre. India had earlier drawn a blank in attempting to negotiate directly with the Seychelles Opposition leader, Wavel Ramkalawan, who is of Indian origin. Until 2020-21, when Seychelles is due for presidential and parliamentary elections, it may not be possible to move the agreement further for ratification; rather than renegotiate or cancel it entirely, it is best to keep it in abeyance. This softer approach adopted by the government is in remarkable contrast to the strong-arm tactics it has used in the past with other countries in the IOR, such as the Maldives. India’s very public statements against the Abdulla Yameen government have now led to a considerable setback to its strategic position there, with the Maldives insisting on sending back Indian naval and coast guard helicopters from its atolls. A less confrontational approach in the case of Seychelles, with quiet negotiations instead of public recrimination, indeed appears to have had a more salutary effect. The Insurance Regulatory and Development Authority of India has approved a proposal to allow the Life Insurance Corporation of India to increase its stake in the ailing state-owned IDBI Bank to 51%. 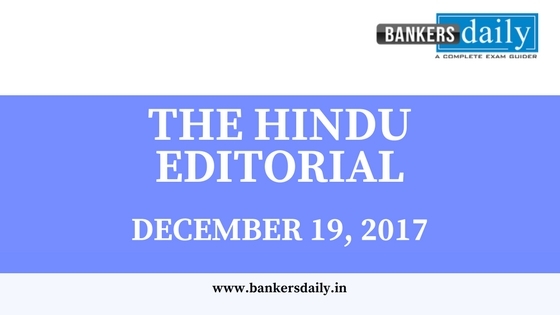 The plan envisages the insurer injecting much- needed capital into the financially stressed lender, which was placed under the Reserve Bank of India’s prompt corrective action framework in May 2017 as a consequence of its non-performing assets rising beyond a threshold. While there are no details on how exactly this capital infusion will take place — reports suggesting that the LIC may acquire the additional 40% stake it would need to reach 51% shareholding from the Government of India — market speculation and media reports have estimated figures north of ₹10,000 crore. While for the LIC the sum is a small fraction of the ₹1.24 lakh crore it received in just first-year premiums in the year ended March 31, 2017, for IDBI Bank the funds would almost equal the ₹12,865 crore in capital infusion it got from the government in the last fiscal. Whether this will be adequate to even staunch the flow of red ink at the troubled bank, leave alone help it turn around, is another matter. The bank posted a net loss of ₹8,238 crore in the 12 months ended March 31, 2018, and is facing the prospect of more losses with gross non-performing assets rising to 28%. The proposal raises several troubling questions. The government clearly sees it as a relatively painless way to recapitalise the bleeding bank without adversely impacting its fiscal position, but the risks in increasingly banking on state-controlled cash-rich corporations to help bail out other state-owned companies or lenders are too significant to be glossed over. Then, there are the regulators. The IRDA, whose mission is to “protect the interest of and secure fair treatment to policyholders”, is reported to have exempted the LIC from the well-reasoned 15% cap on the extent of equity holding an insurer can have in a single company. This puts at risk the interests of the premium-paying customers of the LIC. The Securities and Exchange Board of India has in the past waived the mandatory open offer requirement under its takeover regulations when it involved a state-run acquirer and another state enterprise as the target. As the capital markets watchdog, SEBI has an obligation in all such cases to weigh the interests of the small investor. And the RBI, as the banking regulator, should not ignore the contagion risks that the level of “interconnectedness” the proposed transaction would expose the entire financial system to. Meaning: A campaign of flattery, friendliness, and cajolement designed to achieve the support or agreement of others. Meaning: To arrange something on a flat surface. Example: Most of Manhattan is laid out in/on a grid pattern. Meaning: Temporarily not being dealt with or pursued. Meaning: An increase or improvement in quality, value, or extent. Meaning: Supreme power or authority. Meaning: Negotiate (something) again in order to change the original agreed terms. Meaning: Connected with human activity at sea. Example: Amalfi and Venice were important maritime powers. Meaning: The fact or process of taking carefully planned or cunning action. Meaning: Elicit no successful response; fail. Meaning: A state of temporary disuse or suspension. Meaning: Worthy of attention; striking. Meaning: A method or a type of behaviour that involves using force and threats to make people do what you want. Example: Police resorted to strong-arm tactics to break up the protest. Meaning: Tending to deal with situations in an aggressive way; hostile or argumentative. Meaning: Discussion aimed at reaching an agreement. Meaning: Arguments between people who are blaming each other. Example: The peace talks broke down and ended in bitter mutual recrimination(s). Meaning: Experiencing difficulty and problems. Example: The country’s ailing economy. Meaning: Introduce (a new or different element) into something. Meaning: A level, rate, or amount at which something comes into effect. Meaning: The act of providing more money or resources to make something stronger and work better. Example: Central banks acted to calm nervous financial markets by providing an infusion of cash into the system. Meaning: Investment in stocks, property, etc. in the hope of gain but with the risk of loss. Meaning: To stop something happening. Example: The country’s asylum laws were amended to staunch the flow/flood of economic migrants. Meaning: A situation in which a company is losing a lot of money: bleed/leak/spill red ink. The parent company has been falling apart for several months, bleeding red ink, and losing clients. the flow/tide/sea of red ink; The boom a decade ago has now given way to a sea of red ink. Meaning: Chances or opportunities for success or wealth. Meaning: In a way that prevents success or development; harmfully or unfavourably. Meaning: Having a lot of cash available to spend. Example: It is a cash-rich company, and so has no problems in finding the money needed to bid for its rival. Meaning: To bail out is also to stop doing or being involved in something, esp. to avoid failure or difficulty. Example: The TV show triggered a number of protests, and some of the sponsors bailed out. Meaning: refrain from insisting on or using (a right or claim). Meaning: An act of assuming control of something, especially the buying out of one company by another. Meaning: A company that buys other companies, usually to sell them for a profit. Example: A business with so much growth is sure to generate interest among potential acquirers. Meaning: A person or organization responsible for making certain that companies obey particular standards and do not act illegally. Example: The Countryside Commission was set up as the government’s official watchdog on conservation. Meaning: A debt of gratitude for a service or favour. Meaning: The situation in which feelings, ideas, or problems spread from one place to another. Example: Brazil’s stock markets were battered by contagion from the problems in other emerging markets.